Lawn Drainage Solutions - Start enjoying your lawn today! American Landscaping Service, LLC specializes in residential drainage systems and have the machinery and operators to complete the job correctly and efficiently. Our drainage solutions will meet your needs as well as comply with local storm-water laws and permits. A professional Drainage System is needed to fix issues with standing water, storm-water run-off, or other water problem areas. There can be many components to a good functional drainage system. A french drain is a key part in this system because all the pipes you can buy are all useless if they have nowhere to discharge the water they carry. In a lot of cases a foundation drain and french drain are all that's needed, but many times you need to add catch basins, channel drains, etc. to help with quantities of water. We offer years of experience in many types of drainage systems and are always ready to help you find the drainage solution to your water troubles. CONTACT US today to schedule a consultation to discuss your Drainage needs, and let the pros at American Landscaping Service take care of your lawn and landscape drainage problems once and for all. If you already know how you want the drainage system install or have a drainage plan we can provide you with an estimate. Otherwise, we recommend a consultation to come up with a solutions to your unique situation. Consultations are available from informal to formal and are a fee based service ask for details. French Drainage Systems- Stop surface water from invading your home before it reaches the foundation with an outdoor French drainage system. Dry Wells- Instead of adding excess water from downspouts and drains to your lawn, drywells are sub surface chambers that store and dispose water back into the ground naturally. Surface Drains- Eliminate wet areas that can form into ice or stop water from seeping into garage doors with surface catch basins and strip drains. Gutter Drains- Take the water coming off your roof away from your home to prevent flooding and property damage. Storm Drains- Large scale water issues need large scale solutions, storm drains help you when the weather is at its worst. Drainage Pits- Areas designated as drainage basins will keep wet areas away from where you and your family are. Drainage Piping- The right choice of piping product depends on the conditions and the needs of the system, only a professional will be able to help with these important decisions. Box Drains- Simple box drains can make the difference of a wet lawn or patio and a dry one. Driveway Drainage Systems- Many driveways slope towards your home and there is not much to stop the water runoff from entering your garage or basement, strip drains will stop water in its tracks. 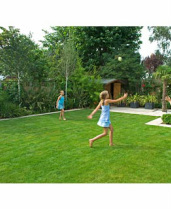 Backyard Drainage Systems- A dry healthy lawn is the key to enjoying your back yard. Standing Water Drainage Solutions- Sometimes it’s as simple as soil composition and adding gravel to wet areas to make them usable. A french drain has more than one function. It is a channel to carry water away from unwanted areas, but also acts as a storage container until the water has had time to be absorbed back into the ground in a chosen area away from structures and walking areas. 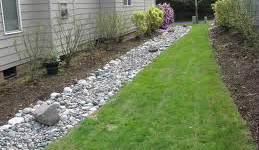 A french drain is a great way to deal with standing or slow moving water in the lawn, but the main idea is to get the water under ground and not see any standing or moving water on the surface. As good as a french drain can be, it is still important to take account of all the sources that put the water in your yard to start with. Gutter down spouts, crawl space sump pumps, A/C drain pipes, etc. all need to be piped away from the house, but don't need to redistribute the water back onto the surface. Instead it is a better practice to tie these systems directly into the french drain so the excessive water is out of the lawn altogether. Any other problem areas where water likes to collect should also be addressed with catch basins, channel drains, etc. to get water moving under ground and away from traffic areas. When a foundation drain is installed around a structure it is important to have an adequate system to move this water away from the structure as so the water is not reabsorbed back near the foundation. A french drain work great for this as well. French drains and foundation drains are almost the same kind of system, and work hand and hand together to catch run off of the structure and excessive ground water and channel it away. After a drain system is installed, you have the problem of a muddy lawn. That's why it's great to hire a landscape contractor for your drainage system instead of a plumber. When the plumber is finished digging, he's finished with the job, leaving you to take care of the mess. The pros at American Landscaping Service know all about lawn care and sod work. After the dig, have us repair the lawn and replace it with new sod. Landscape Drainage System Problems? Contact Us Today for Service and let the pros at American Landscaping Service take care of your landscape drainage problems once and for all.